David Perez is FSU's first Udall Scholar since 2009. A Florida State University environmental engineering major has been selected as a recipient of a prestigious 2017 Udall Scholarship. David Perez, a junior from Homestead, Fla., who has established himself as a thoughtful and prodigious researcher at the FAMU-FSU College of Engineering, will receive a cash stipend of up to $7,000. Udall Scholars are selected on the basis of commitment to careers in the environment, Native health care, or Tribal public policy; leadership potential; record of public service; and academic achievement. In two years at Florida State, Perez has developed a formidable research résumé. He’s conducted sophisticated investigations and taken a solution-based approach to international issues of water quality and wastewater infrastructure. Nevertheless, this recognition took him by surprise. 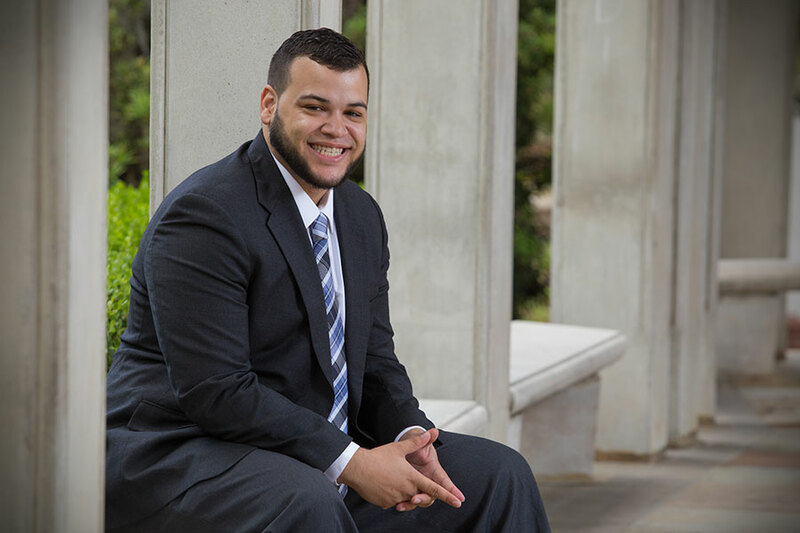 While Perez’s academic talents are now routinely honored with scholarships and superlatives, it was only a few years ago that he had dropped out of college with a 1.78 GPA, soured by his experiences and disenchanted with higher education. After graduating high school in 2009, Perez enrolled in Miami Dade College. He found the adjustment more difficult than expected. After dropping out of community college, Perez began picking up work as a tutor. It was then that he met a troubled but precocious sixth-grader who challenged his own self-perception and changed his attitude. That, Perez said, is when it hit him. Buoyed by this revelation, Perez resolved to take his academics more seriously. He moved to Tallahassee, enrolled in Tallahassee Community College and, with his renewed commitment to taking a more proactive approach to his coursework, passed all of the classes that had once left him feeling dejected and aimless. From there, Perez never looked back. He soon earned admission into Florida State, raised his GPA and became a mainstay on the Dean’s and President’s Lists. Since arriving at FSU, Perez has adopted a global research perspective. In addition to conducting research on campus, he has studied biofuel production at the Brookhaven National Laboratory in Long Island, N.Y. Last year, he received the U.S. Department of State’s Benjamin A. Gilman Scholarship, which funds study and intern abroad opportunities for Federal Pell Grant Students, and he traveled to India to investigate innovative solutions in the remediation of contaminated drinking water. Perez credits much of his success to mentors such as FAMU-FSU College of Engineering Associate Professor Clayton Clark, who helped shepherd him through unfamiliar experiences and enrich his academic life. Adrienne Stephenson, assistant dean of FSU’s Graduate School and director of the Office of Graduate Fellowships and Awards, first met Perez while serving as the STEM Center Coordinator at Tallahassee Community College. This summer, he plans on studying the treatment of water that has been contaminated by chemical warfare agents. He also intends to continue a history of laudable work promoting science education among minority and marginalized groups. In August, Perez will attend the five-day Udall Scholar Orientation in Tucson, Ariz., where he will meet and collaborate with his fellow Udall Scholarship recipients. Perez plans to continue conducting rigorous research while beginning preparations for graduate school. Despite his late start at FSU, 25-year-old Perez shows no signs of fatigue. The Udall Scholarship honors the legacies of Morris Udall and Stewart Udall, whose careers had a significant impact on Native American self-governance, health care and the stewardship of public lands and natural resources. For more information, visit https://www.udall.gov/. The Udall Scholarship requires a university nomination. For more information, contact the Office of National Fellowships at http://www.onf.fsu.edu.